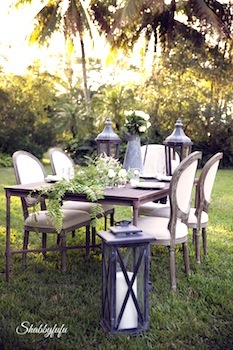 Savvy Southern Style : Are You Ready? Ah, spring, my favorite season. While it seems many of you pick fall as your favorite mine is spring. 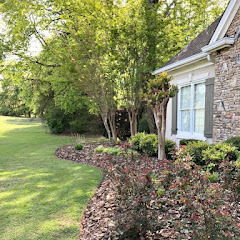 Spring brings new life and growth, Yes, it is followed by the heat of summer which I don't care for, but I love the sight of green again outside and the flowers popping up after a winter slumber and I get to work outside in the yard again. I am joining some fabulously talented friends today to bring you some beautiful spring inspiration so be sure to check out those links at the end of the post. I thought I would invite y'all over, virtually that is, to join me for snack of cake and coffee or do you prefer tea? I pulled out my china I inherited from my grandmother that has the cutest flowers on the border. Perfect for spring. I bought some tulips, irises, and daisies and put them in a large glass vase. This almond raspberry cake sure is good. I had to sample it....sorry. Everything is added to this large slatted wood tray. In the hutch I added some stock and a few lemons. And after the cake is gone the cake stand can be replaced with these yellow bowls to keep this centerpiece out a bit longer. It's officially less than three weeks away and signs of it are popping up around here. 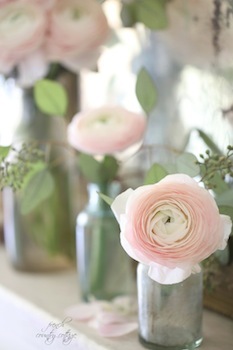 Be sure to check out what my fabulous design friends below for lots of spring inspiration and Happy Leap Day! Happy Leap Day to you too!....Love the beautiful tray of your grandmother's exquisite china for a glorious cake and tea presentation. I am crushing over the floral arrangement of the irises, tulips, and daisies!....Such a great compliment to your beautiful hutch. 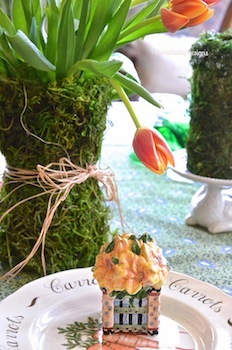 I am so ready for Spring....I will have a slice of that fabulous cake please....(cake freezes well :) !) Happy early Spring and thank for the inspiration! Thanks my friend. Nope, throwing the leftover out. I don't need it around enticing me. What a great tray to keep everything grouped together and that cake looks delish! 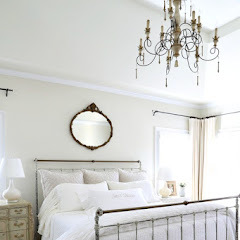 Perfect mix of colors in your room...so inviting! Ready for Spring here and even summer! We like to camp, take our boat out, etc. love being outside! Daffodils are blooming here, my tulip tree has buds - some almost open - and I have seen some blooming bradford pears. 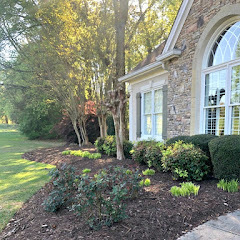 We worked in the yard a little this weekend. First fire of the year (burned some clippings)! Things are blooming around here, too. I'm so happy to see it. Your dining room is always enviable but even more so with your beautiful!! flower arrangement and grandmother's china. And that cake looks amazing! 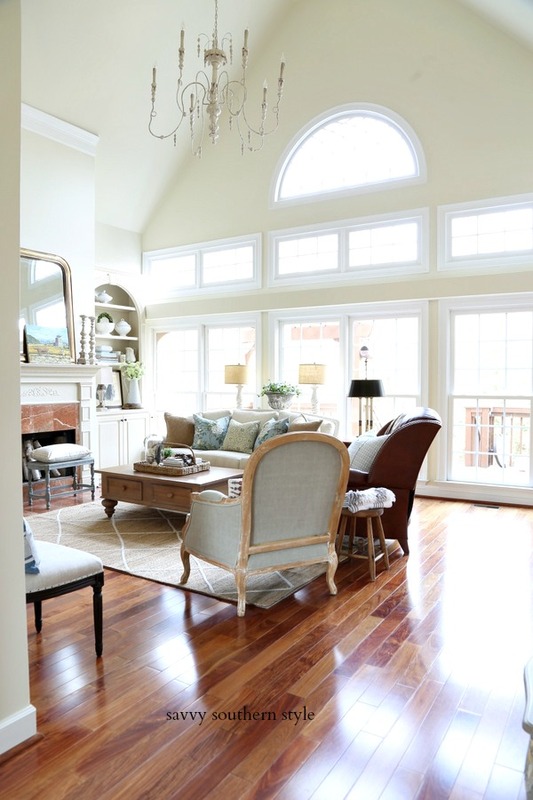 Thanks for always inspiring us to make our homes more beautiful, Kim! Awe, thanks so much, Linda! Very pretty Kim! That cake looks yummy! Thanks, Penny, it was yummy! Always so gorgeous Kim!! 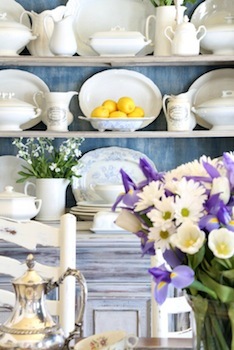 I am in love with your dining room-and ironstone display- and that cake looks delicious!! Enjoy!! Happy leap day to you too, Kim! LOVE the flowers you chose and your Grandmother's china is almost exactloy like my Grandmothers too! The cake looks SO yummy, I wish I could actually run over and share some! Have a great day. I am SO ready for Spring. I wish you could run over here, too. Wouldn't that be fun? Gorgeous and Springy Kim-Love it! The vivid yellow lemons and the deep purple irises are just gorgeous together. We use our "best" and only Limoges fine china every meal, every day. And the real silver. It doesn't tarnish if you use it regularly. Life is too short to "save" your best for special occasions only. And not having an everyday set saves a lot of space. We have some inexpensive Ikea dishes and settings for when we have big parties (like 30-50 people) and don't want to put out plastic and paper. That is a great idea to use and enjoy the good stuff. 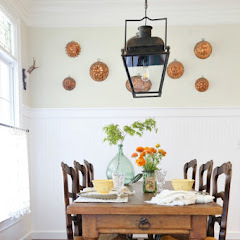 Kim, your spring touches in your dining room look so beautiful and cheery! I love your grandmothers china, I also have my grandma's china, it is so special! I love the lemons and white flowers in your hutch. So pretty. I love how your grouped everything in the wooden tray in your dining room table. And the cake, Oh boy, that cake looks delish!! Thank you so much for the deliciously looking tea party!! Have a wonderful week! Thanks so much! This was fun to put together. looks gorgeous. how much cake did you really have? Well, I'm not telling. Back to eating right now! 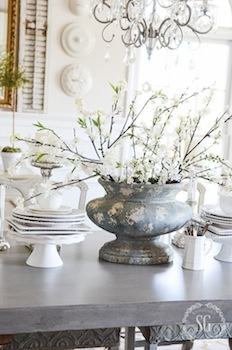 Your Spring table vignette looks gorgeous! Love your timeless treasures from your Grandmother:) The cake looks mighty yummy as well! Thanks, Cindy. I am glad I got her china to enjoy. Kim your table looks beautiful! I love the wood tray so pretty! The blue on the back of your hutch is stunning!! I would love to come by for tea and cake!! Thanks, Susan and come on over! Kim, how wonderful that you have your grandmothers dishes. And how nice of you to invite me to tea! Beautiful as always! Beautifully done! Love the china from your Grandmother and the beautiful flowers. It all looks so great displayed in the big tray. That cake looks yummy! I'm SO ready for spring! 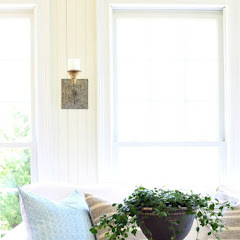 You've created such a pretty and inviting vignette. I just love the combo of your rustic tray with the silver and your grandmother's china. The cake looks delicious! What a beautiful spring table and I love the tray with your grandmother's china. I am loving the pretty combination of colors that you've used to compliment the colors in your grandmother's beautiful china. So happy that spring is just around the corner, too! This post just put me in a Spring mood. Beautiful! Kim it looks beautiful! I love your Spring touches. Those are the prettiest flowers! That cake looks yummy too. I'll take a slice with a cup of coffee please. Beautiful!!! I love all the white and your vase of flowers are some of my favorites! And i hope you're enjoying every bite of that luscious looking cake! Do you mind if I ask, where did you find your gorgeous tray? That is from antiquefarmhouse.com from a few years ago. Not sure they bring that up for sale anymore. You will have to just watch their daily sales that pop up. Gorgeous! I wish I were coming over. That cake looks fabulous as well!! Grandmother's china to treasure always. Beautiful fresh flowers, lemons, every thing we need to welcome spring. The thing that most welcomes me is your delightful personality! I enjoyed "The Tea".